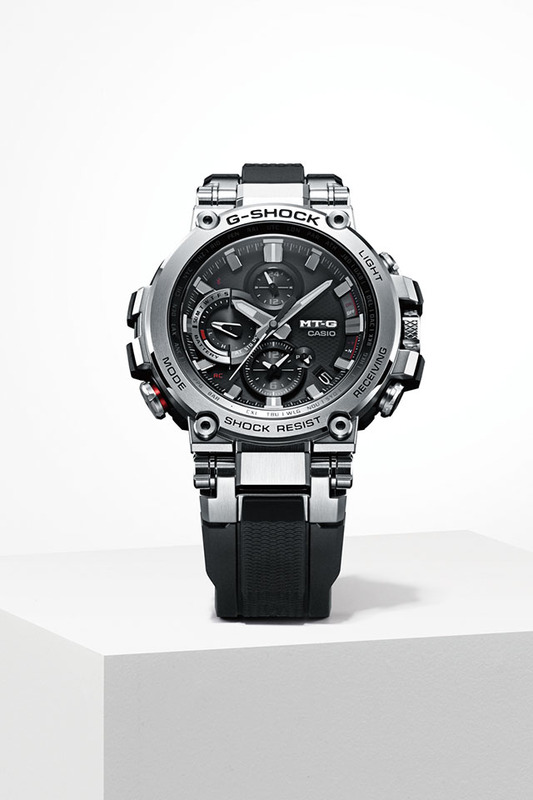 Part of G-SHOCK’s luxury MT-G men’s collection, which is known for its metal and resin hybrid construction, the MTGB1000-1A features a polished look, complete with a redesigned core guard box frame, which yields a 1.11mm slimmer and 1.58 mm smaller case width. In addition, a new band structure composed of urethane and fine resin are affixed to one another by screws, then securely affixed to the case with metal parts. The MTG-B1000 keeps accurate time anywhere in the world using the Connected Engine module, which connects to a time server via a paired smartphone or using radio wave time-calibration signals. The watch connects to the G-SHOCK Connected smartphone app to enable the user to easily set the world time and alarms from the app. The app also collects and analyses usage data from the watch to realize various features such as reminding the user to charge the watch and warning about possible magnetic interference. The model also comes with premium features such as G-SHOCK’s Multi-Band 6 Atomic Timekeeping Technology, which provides accurate timekeeping virtually anywhere via radio signals from up to six different transmitters worldwide. The MTGB1000-1A also features a sapphire crystal to protect against scratching and tough solar technology. The watch also comes equipped with standard G-SHOCK technology of 200M water resistance and shock resistance, in addition to dual dial world time (up to 300 cities selectable within the app), a full auto Super Illuminator LED light, stopwatch and countdown timer, daily alarm, and full auto calendar – all in a 51.92mm case. The MTGB1000-1A will retail for $800 beginning in July 2018 and will be available for purchase at select Macy's, select jewelers, shopcasio.com, and the G-SHOCK Soho Store.